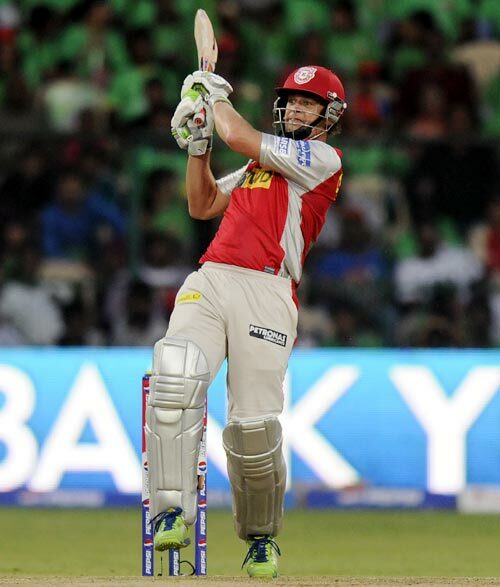 Adam Gilchrist scored a dazzling unbeaten 85 to guide Kings XI Punjab to a seven-wicket victory over Royal Challengers, in Bangalore, on Tuesday. Chasing a stiff target of 175, the former Australia wicketkeeper-batsman hit a 54-ball 85, studded with 10 fours and three huge sixes, to take the Punjab side home with 11 balls to spare. Earlier, Kings XI won the toss and elected to bowl. Veteran speedster Zaheer Khan played his first match of the tournament, as he returned to competitive cricket after nearly five months. He replaced Abhimanyu Mithun while Muttiah Muralitharan was drafted in place of Ravi Rampaul. Bangalore made a slow start with the bat before Cheteshwar Pujara crumbled under the pressure and holed out off Parvinder Awana to the fielder at point after scoring 19. 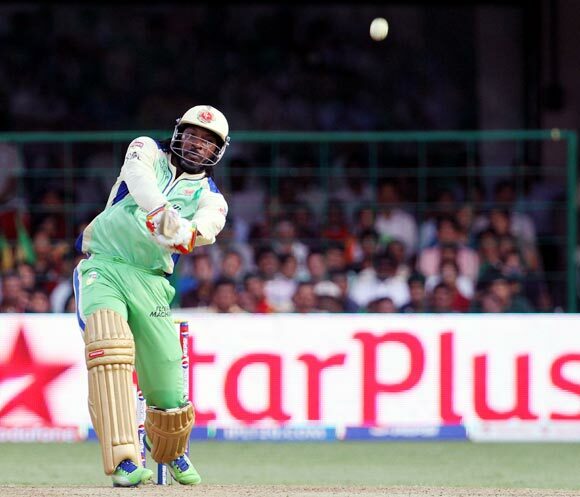 Chris Gayle surprised his home fans by resorting to a defensive approach at the start of the RCB innings. He hit his first boundary off the 13th ball he faced, cutting Awana through point in the seventh over of the innings. After 10 overs, Bangalore were struggling on 52 for one, with Gayle on 17 off 24 balls, having just two fours, while Virat Kohli was on 16 from as many balls. The Gayle-Kohli combination which has worked wonders for the RCB again came into fore as both played confidently. They were watchful for the first few overs but then unleashed a barrage of strokes to change the script in the second half of their innings. 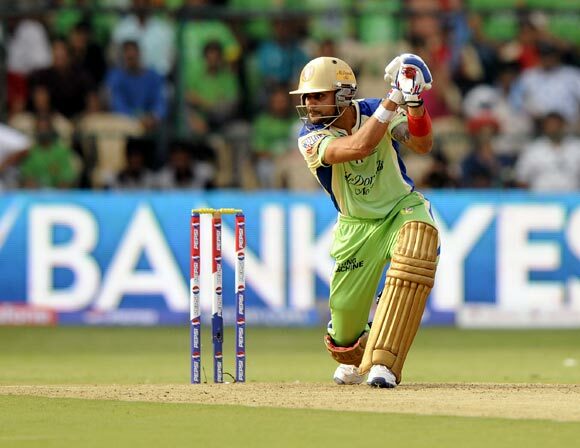 Captain Kohli again made a key contribution with the bat as he hit 57 off 43 balls, hitting six fours and two sixes. Gayle led the charge in the final overs as he hit a quickfire 77 from 53 balls, with the help of six sixes and four boundaries. Gayle and Kohli put on 137 runs for the second wicket, the West Indian left-hander hitting Manpreet Gony for three successive sixes in the 15th over of the innings. Bangalore's batsmen hammered 86 runs from the last six overs of the innings to post a competitive 174 for five in their 20 overs. 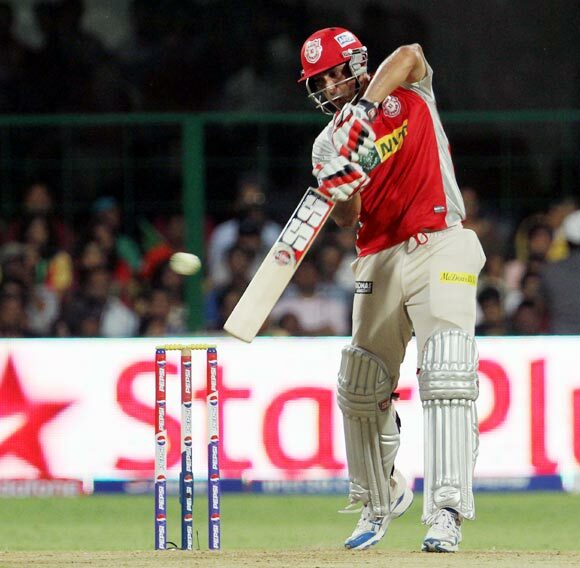 For Kings XI, Awana had the best figures -- three for 39 -- while Azhar Mahmood claimed two for 24 in his four overs. Zaheer Khan, who made a comeback to competitive cricket after nearly five months, cleaned up Shaun Marsh in his second over to give RCB a good start with the ball. It was Azhar Mahmood who lifted Punjab after the early dismissal as he hit Moises Henriques for three successive boundaries in the sixth over. Mahmood and Adam Gilchrist, whose cumulative age is 79 years, proved there is no substitute of experience as punished the Bangalore bowlers. 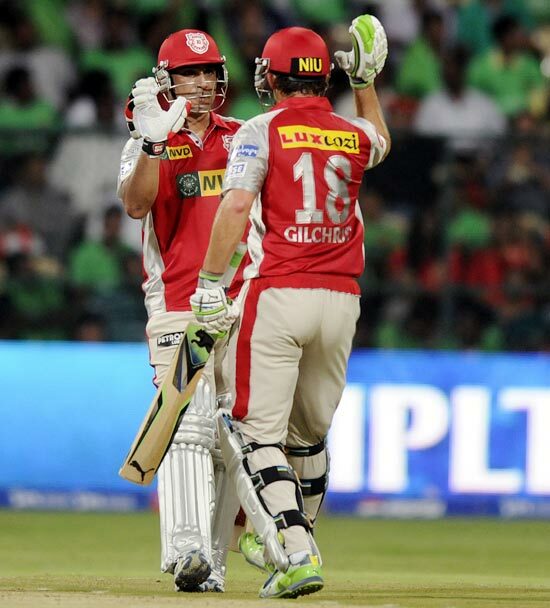 The duo put on 118 runs from 77 balls to take the game away from Bangalore and leave the home crowds shell-shocked. Taking cue from Mahmood's positive approach, Gilchrist, who had only one score of 40 plus in the tournament also got into the groove as he hit some cracking strokes. The Aussie dasher brought up his half-century with a straight six off Zaheer. The stand-out shot was the inside-out six over extra cover off Muttiah Muralitharan, which he followed with another six -- a slog sweep over deep square leg. Gilchrist blazed his way to a 54-ball-85 which had 10 fours and three huge sixes as his team romped home with 11 balls to spare. Will Kings dent Sunrisers' chances at Mohali? 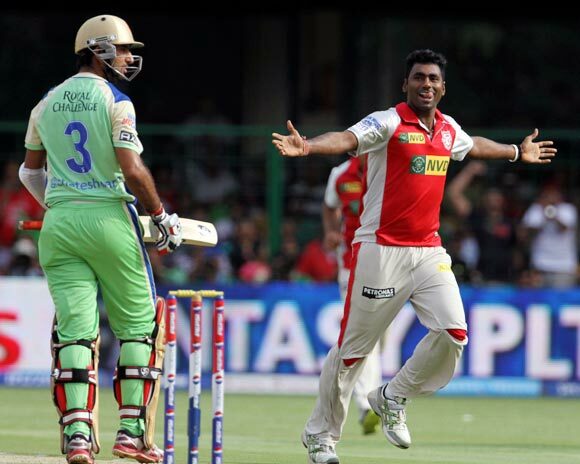 IPL: With nothing to lose, can Delhi surprise Bangalore?